By Arfa Mirza in Office. Updated on November 18, 2017 . A few days ago, my secretary went on leave. Before leaving, she was kind enough to ask me if I need a replacement for her as she will be off for two weeks. Initially, I liked the idea but then a thought struck me. Every now and then I see professional newsletters and weblogs crying out the importance of multitasking for a thriving professional life. So I decided that while my secretary is away, I’ll take this as an opportunity to try out multitasking, you know, to brush up my productivity skills. The very next day, I started implementing multitasking to my regular professional life. My day buzzed with phone calls, scheduling and re-scheduling, meetings and coffee-making, all on top of my routine tasks. It was not long before I started to feel that this new routine is seriously impacting my productivity. What I am about to share with you in this piece of writing is the essence of my multitasking experience. In the two weeks, there have been times when I had a really brilliant idea for a campaign design, but I was distracted to do another task, after which, I couldn’t recall what the idea was. I’ve heard of scientific facts about how the human mind woks best when it is focused on a single train of thoughts. And I was actually experiencing one myself. When we try to focus on multiple unrelated tasks or thoughts, simultaneously (like regular multitasking), it becomes difficult to regain focus and remember where we left off in each of those tasks. There are often projects or jobs that need your special focus and concentration – more than the regular ones – but when you are needed elsewhere, your mind subconciously shift your focus onto other tasks. And you end up frustrated, like me. It is a common misconception that multitasking increases your efficiency. In fact, you tend to just skim through the tasks to get more done. This will slow down your productivity level, especially with tasks that require brainstorming and a proper thought process. Frequent multitasking affects your efficiency like shutting down and restarting the CPU affects the efficiency of your computer and the work it is doing. If you muster up your focus for one task and do it with all your mind and heart, no matter how small or insignificant the task is, it can prove to be more productive to yourself and your employer/client. Having your focus scattered across too many things, may lead you to mess up real important things like deadlines, important meetings and scheduled tasks. Brainstorming, analytical thinking, problem solving and creativity are associated with every professional’s life. These terms are also especially important for writers, designers and other creative professionals. However, multitasking has often proved to be just the right poison for these brain-involving activities. Professionals, who flip between jobs and tasks more frequently, experience a brain drain in terms of analytical and creative thinking process. Moreover, in a human mind, creative thoughts, ideas and solutions have a very short shelf-life, and they have a good tendency to vanish as quickly just as how they pop up in your mind unannounced. Once two or more thoughts leave your mind without being pondered upon, your mind becomes more prone to a creative block or brain drain for a long time. Replenish your Creativity with our articles on creativity. Many professionals are of the view that doing a number of tasks concurrently saves you a lot of time and thus makes you ‘efficient’. Well, there is another side of the story which many of us tend to overlook, as in overlooking human errors. It is a matter of common sense that when you are working on multiple tasks and one task becomes the cause of distraction for the other, there is a higher chance of you messing up, and both tasks (or more) are affected. The thing with mistakes is that it needs rectifying. And fixing a mistake takes time. So basically, you are saving up on your time (by multitasking) to fix the problems created (while multitasking). Another area you won’t expect to be affected by multitasking is your physical and mental health (cue anxiety and stress). Multitasking and frequent interruptions caused by it are sources of stress that can have a notable impact on your mind and body. It is a common fact that whenever demands exceed abilities, stress is bound to follow. 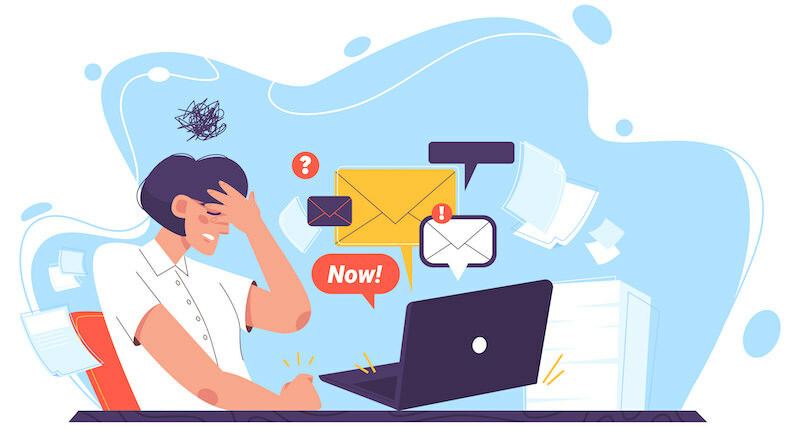 Over time, the stress of multitasking may even become dangerous when fatigue and mental fogginess becomes more prominent, and both productivity and passion for work decline. In the kind of work culture we have developed in today’s world, multitasking seems inevitable, even viewed as an advantage when it comes to job-seeking. However, according to repeated research and my own personal experience, multitasking is not only absurd, it is counterproductive as well. By writing this article I am not at all suggesting that multitasking is not possible for the human mind. I would rather say that although we can always add one more ball to our juggling act, every time you multitask, you have less attention for creative thought and memories. No matter how demanding your job is, do not let multitasking take a heavy toll on your work, or on you.